Have you made any Valentine cards yet? I’m just getting started. I wanted to share a card with you today that would be great for a Mom, sister, or a close friend. This card is versatile enough that if you’ve already completed your V-Day cards you could hang onto the idea for Mother’s Day, or a birthday by simply changing the inside sentiment. Thanks for hopping all the way to the end of the list, my card is sure not to disappoint! PLUS just for commenting on this post (or any along the way) you have a chance to win 4 spools of May Arts ribbon -your choice! Happy Hopping! I love this silk ribbon from May Arts (I just can’t stop touching it). To create the smooth looking braid I tied the three stands together in a knot, then folded each color in half length-wise.While braiding be sure the outer edge of the fold is in the centre of the braid. When your braid is the desired length, tie it off with the ivory twisted burlap string. Fold the knotted end over the edge of your paper and sew. Cut the knot off the back side. For an additional feminine element add a strip of white 5/8″ crochet ribbon. 368-58-01 White Crochet, 363-09 ivory twisted burlap string, 1.25″ silk in white, rose, and burgundy, Stampin’Up cardstock, My Minds Eye- pattern paper, brads, word stickers, Xyron adhesive, sewing machine. Thanks for stopping in today! Please continue along, and leave some love for your chance to win 4 spools of May Arts ribbon. This is beautiful! I’m going to give this one a try. Wow, this looks just beautiful, Virginia! I love all the different textures – you have real talent! Love the braided ribbon!! Cool design! Once you get one you’ll want them all. I’d like to take a bath in them they are SO soft! Wow! Stitching and braiding… absolutely gorgeous. Love all the perfect details. 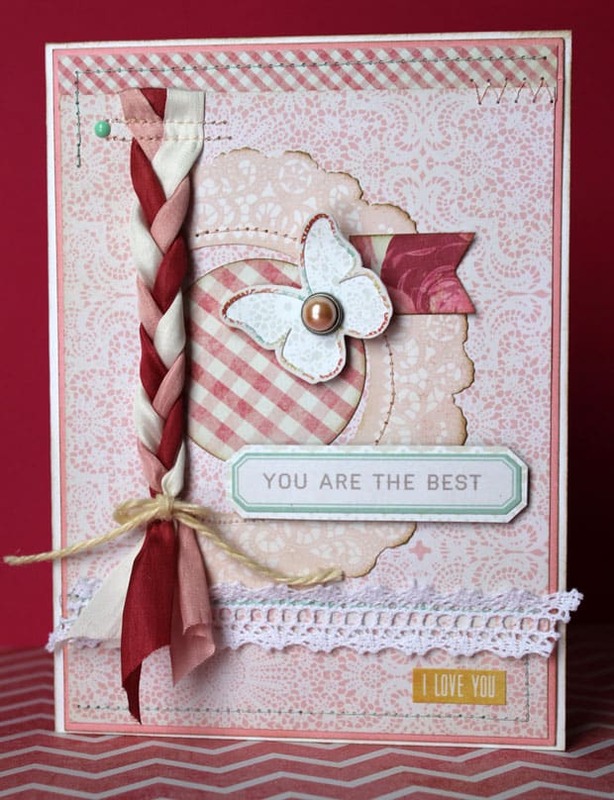 I love your card and what a fabulous idea of braided ribbon. That is so cool looking along with all the lace and stitching you did on this design. Love the braid design. Very unique. TFS! Gorgeous card! I love the braided silk ribbons… yummy! 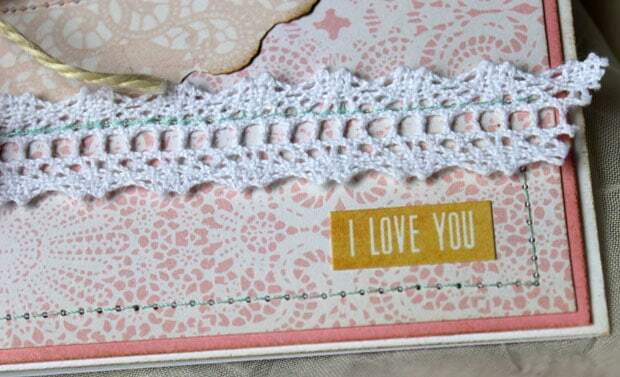 And the layering and crochet trim give the card some great texture in addition to the braid. Very pretty! Thanks for the tip on folding the ribbon to get that full look when it’s braided! Love the sewn details on this card. Braiding your ribbon was an act of genius. It adds such panache to your card. Hmmm. Now I’m going to be braiding things for my cards. I think some twines would be cute done this way too, but silk ribbon, oooohhhh! Pretty card. I really liked the cards on this blog hop, but I really must say that this is my most favorite card that was created with the ribbons. Just love your style. Gorgeous! Wow Virginia! You certainly did not disappoint! I think your card is my favorite today and that is saying a lot 🙂 I too love the silk ribbon from MA – I just want to roll around in it – it so soft and luscious! This is a perfect kind of card for someone besides your partner – thanks for the inspiration! I am not familiar with your blog, but I have signed up for emails as I definitely love your style! Lovely card and I really like how you braided the ribbon. The braided ribbon really ads detail not found on cards. TFS. The braided ribbon is perfect bling to add the finishing touch to your project.. Simply beautiful. Love the braided ribbon! Lovely! The braided ribbon is such a nice touch! Gorgeous card, love how you braided the ribbon, I would of never thought of doing that. Love the soft colors. Beautiful Virginia! I love braided ribbon and all the stitching adds great texture. Love how you used your ribbon!! Wow!! That braided ribbon is the coolest thing I have ever seen! Very pretty! The braid is beautiful! The card is so creative! I love the braid and the machine stiching. Oh man! Breathtaking! This is so beautiful!! Pretty card, love how you braided the ribbon! Thanks for sharing! Now this is cool! I love the bradding! Totally ended the hop with a BANG! Beautiful card. Love the braided ribbon idea. Love how you braided and then stitched the ribbon in place, what a neat idea! I love the idea of braiding the ribbon. Your card is so pretty! Beautiful! Love the stitched braid. 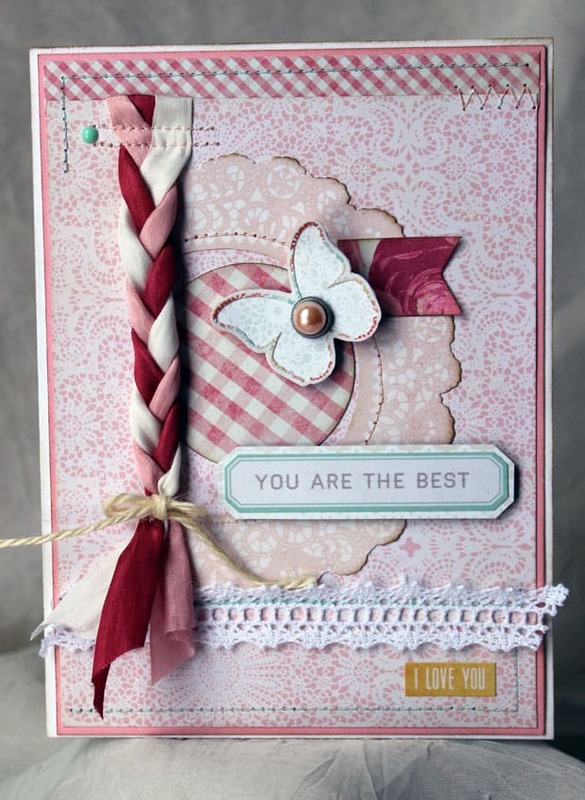 Love the braided ribbon& all your extra touches really makes this card stand out. I’m stealing your card idea – it’s so beautiful! The braided ribbon is so pretty!